Returning client Mike Davis brought along his buddies for a day’s fishing trip to New Melones on Saturday August the 19th. We had originally planned on fishing Don Pedro but after two great days at New Melones I called Mike and told him that we needed to fish Melones and he said why as I told him how i had done, he said sure thing. So i had better be right and catch what I said we had been catching, so the pressure was on! These guys make their own rules and they each have a half hour to catch a fish, after the 30 minutes is up, then its someone elses turn and if you lose a fish then you loose a turn, if the rod goes down and you grab it you loose a turn. I have a deck of cards on the boat and they cut the cards to see who would go first. Mike was up first and landed a nice fish to start the day, then it was Marks turn, he lost his fish, so he lost a turn, then it was Todd’s turn, he landed his fish. The day goes on with them landing some very nice fish, maybe not as big as the previous day, but we had fish over four pounds. 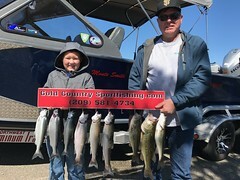 Mark seemed to have tough time landing his fish, so I gave him a few more tips and he started putting fish in the boat. Mikes turn came up again and the starboard side rod got hit hard and this fish stayed down deep not wanting to show, but finally did and as I netted the fish it was a nice German Brown! !, he was bleeding so we had to keep him. The day was coming to a close with nine fish onboard, and as i was putting the rods away Todd asked if he could help reel other rods in, and I told let me put rods away one at a time and just maybe we would get lucky and catch one more fish, with the last rod still in the water, guess what? The rod was hit and we boated the tenth fish of the day. They lost five fish on the day. 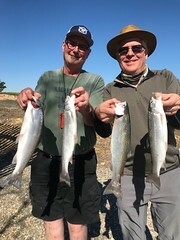 A great day on the waters of New Melones with three great guys!!!!!!! Thanks again everyone. 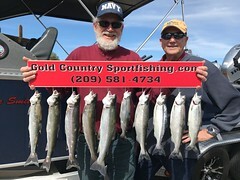 This entry was posted in Gold Country, Gold Country Sport Fishing, New Melones, New Melones fishing guides, Rainbows, Trout. Bookmark the permalink.